The following shows why we all contain many bits of matter from the bodies of Plato, Galileo, Napoleon, Shakespeare, Hitler, and other famous, infamous, and common people of the past. We will use Napoleon for our example. Like all people, he was comprised of enormous numbers of various kinds of molecules. Throughout his life he was inhaling and exhaling nitrogen, oxygen, and other molecules from his environments. Consequently, gas molecules that were once in Napoleon are now in the atmosphere or in the lungs of other people and animals or have combined with hydrocarbon molecules in fires or plants or vehicle engines and are now part of carbon dioxide and other molecules that we constantly inhale and eat. Probably our bodies contain many oxygen atoms and other kinds of atoms that were once part of Napoleon. But we will ignore these bits of matter and focus only on water molecules which constitute over 60% of the human body and about 75% of our brains. 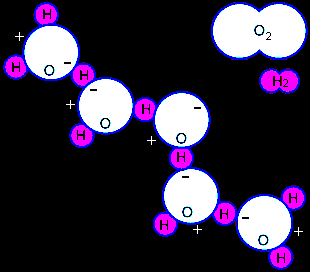 The figure above-right shows one oxygen molecule, O2 (comprised of two oxygen atoms), one hydrogen molecule, H2 (comprised of two hydrogen atoms), and five water molecules, each of which is comprised of one oxygen atom and two hydrogen atoms. These are the most common forms of oxygen, hydrogen, and water in the atmosphere. Oxygen and hydrogen molecules do not react with one another at room temperature but a mixture of O2 and H2 explodes if started by a spark. During the explosion oxygen atoms combine with two hydrogen atoms to form water molecules, H2O, and heat. When cool, the water molecules weakly associate with one another as shown in the figure. Heating by the sun or stove weakens the association and causes evaporation of water molecules. Evaporation and condensation allow water molecules to travel great distances. The figure above-left indicates how most water is constantly moving. We will make conservative assumptions about the amount of water taken in and expelled by Napoleon due to breathing, drinking, eating, perspiration and body waste. For a typical person, urine volume alone is about 1.5 liters per day and can be much more for active people. We will assume this amount for Napoleon, and assume that only 1 liter per day found its way to the oceans via streams, rivers, etc., or by evaporation and subsequent precipitation. The oceans hold over 97% of all water on Earth. They are also the source of about 86% of all water that evaporates into the atmosphere and subsequently returns to Earth as precipitation. The rates at which water molecules from Napoleon made their way to streams, rivers, lakes, marshes, underground aquifers, and oceans around the world cannot be known. It is also impossible to determine how many of the water molecules in our bodies came from sources containing water molecules that were once part of Napoleon. But, when we consider the following numbers, we can see that our bodies must contain many water molecules that were once part of Napoleon. Water molecules are very small, only 0.31 nanometers or 0.000,000,031 centimeters in diameter, so there must be many in our bodies. A person weighing 60 kg (132 pounds) contains about 1200 trillion trillion water molecules (i.e. 12 followed by 26 zeros). To avoid writing and reading these awkward small and large numbers, we will use a standard notation where one millionth (0.000,001) is written 1E-6 and where E means "times 10 to the power specified by the number following E." Therefore, one thousand is written as 1E3 and one billion is 1E9, and the diameter of a water molecule is simply 3.1E-10 m or 3.1E-8 cm, where m means meters and cm means centimeters. The number of water molecules that can fit along one edge of a one centimeter cube is 1÷(3.1E-8) or about 3.2258E7, and the number that can fit on one face of the cube is 1.04E15, and the number required to fill the cube is about 3.3E22. And it takes 1000 cubic centimeters to fill a liter, so there must be about 3.3E25 water molecules in every liter of water. Therefore the number of Napoleon's water molecules that eventually reached the oceans is 3.3E25 molecules per day times 365 days per year times 50 years or about 6E29 Napoleon molecules in the oceans. But the oceans are huge so you might think Napoleon's molecules would be spread out. Actually, the average distance between the molecules is small. The oceans contain about 1.3 billion cubic kilometers of water (about 315 million cubic miles). This is 1.3E21 liters of water, a huge amount. Nevertheless, there are (6E29÷1.3E21) or 4.6E8 or 460 million of the Napoleon water molecules for every liter of water in the oceans. Due to water evaporation and precipitation, Napoleon water molecules have also found their way into lakes and other water supplies. The concentrations are lower in some places and higher in others. Streams fed by glacial melting will have low concentrations of Napoleon molecules, and the Mediterranean Sea probably has a higher concentration. Even if the average concentration in the 1.5 liters of water molecules we consume every day is a million times less than the concentration in the oceans, we still ingest over 500 Napoleon molecules every day. Many of these water molecules in the beverages we drink and fruits, vegetables, meats, and other foods we eat get into our blood, flesh, brains, and most other parts of our bodies. This consideration of water molecule activity helps understand a little of the amazing complexity of our biosphere that many people do not appreciate. It is a clue that things are not always what our senses and minds lead us to believe. It is also an example of important information about nature that is not easy for everyone to understand, even when explained (in spite of the Galileo quote to the contrary). It is an example of how nature is appearing much more complex since Galileo's time. And as the complexity of nature is increasingly revealed by science, it becomes increasingly important that leaders in society be able to understand the complexity so that leadership is increasingly based on currently available evidence.